Engage your prospects. A lead collection/qualification app for your website. A qualified lead is someone who has seen the budget price for their fence and has requested to be contacted. These are the highest level of leads available. More and more companies are cutting back on print and Yellow Pages advertising and are collecting a greater portion of their sales leads via their website. The secret to acquiring leads from your website is a combination of generating traffic, making them confident and comfortable with your company and engaging the customer in such a way that they will choose to contact you. GeoDraw is a lead collection and qualification tool that embeds into your fence company's website. It is designed primarily for homeowner use. A customer draws out his fence line of their jobsite on Google Maps, chooses a spec, and receives a budgetary range estimate for their project. During the process GeoDraw collects the name, address, email, and phone number of the contact. GeoDraw engages the customer in the process and gives them a feeling of investment in the project right from the start. 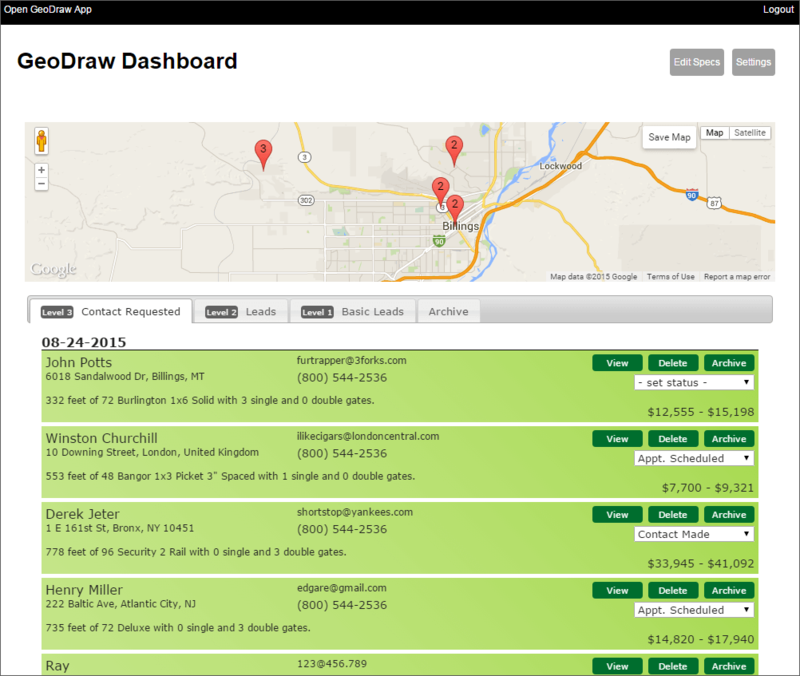 GeoDraw collects three levels of customer leads. Level 3 are those who see the budget and ask to be contacted. Level 2 are those who see the budget price and do not immediately request contact and Level 1 are those who just visit the app but do not get far enough to see a budget price. Level 3 customers are prime leads, those ready to buy immediately. Level 1 & 2 users are still in the market for a fence. Level 2 and 3 contacts are emailed to one or more users at your company upon the close of their GeoDraw session. Level 1 contacts are stored and can be viewed on the GeoDraw Dashboard. All contacts can be downloaded to Excel. We leave it up to you to decide how you want to respond to each level. It is costly to send salespeople out for an onsite estimate. GeoDraw can help reduce the number of Looky-Loo sales calls and enable you to focus on those prime prospects that already have a good idea of the cost of a project and want to move forward. These are the most qualified of sales leads. Fence Description: 334 feet of 72 Burlington 1x6 Solid with 2 single and 1 double gates. 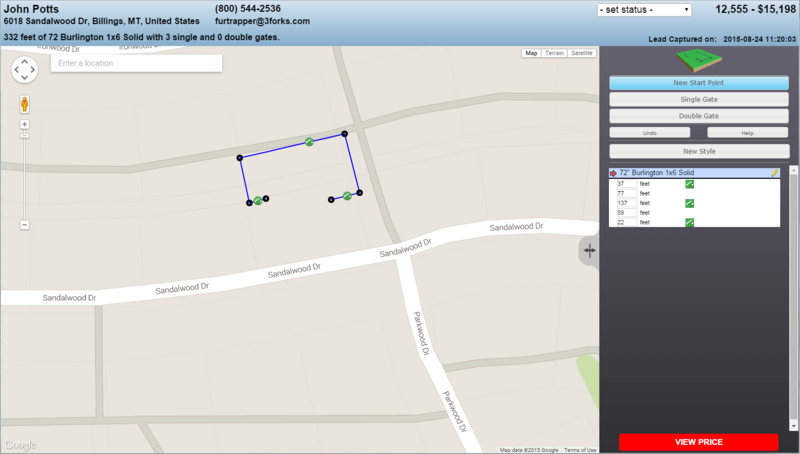 GeoDraw produces an automated budgetary onsite estimate without you having to leave your office. Your potential customers get an on-site estimate at their home. Customers who have entered their job, received a rough budgetary estimate and asked to be contacted are the hottest leads there are. We also supply the data on prospects who do not request a contact - these may not be the hottest of leads - but still looking to buy fence. GeoDraw enables a potential customer to call up their project location on Google Maps or Google Earth, draw out their job, and be rewarded with a budgetary range of the cost of the project based on per foot and per gate charges. If the customer is comfortable with the price, they are presented with a lead capture form - producing a truly qualified lead and saving your salespeople from wasting time on non-viable prospects. GeoDraw produces three grades of leads. Level 3 leads have seen the budgetary price and have asked to be contacted. Level 2 leads have seen the budget price but have not asked to be contacted. Level 3 leads provide a name, job address, email address and phone number. Level 1 leads have departed the app before seeing a price. All three levels are people shopping for a fence with Level 3 being the most qualified lead. All three Levels can be accessed from the GeoDraw Dashboard. 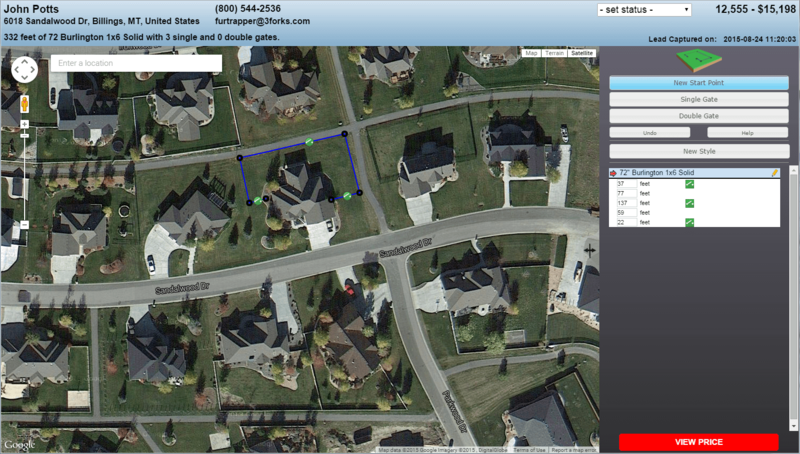 GeoView is a live report is designed for your sales staff. 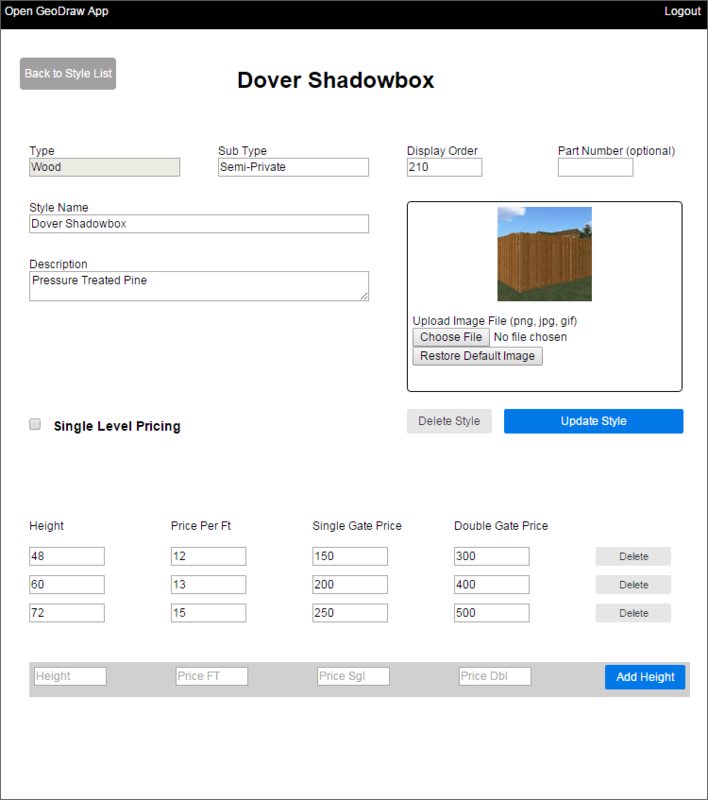 It displays all of the information input by the customer to get their budget price including all of their contact information, the type of fence, the budget range, the date, the footage and gates, their job layout, the style selected and it is still active in GeoDraw so you can use it to refine measurements and calculate alternatives. GeoDraw is designed to be easily used by the general public. It is functional on most web accessible devices. Upon entering, they provide their name, email and project address. 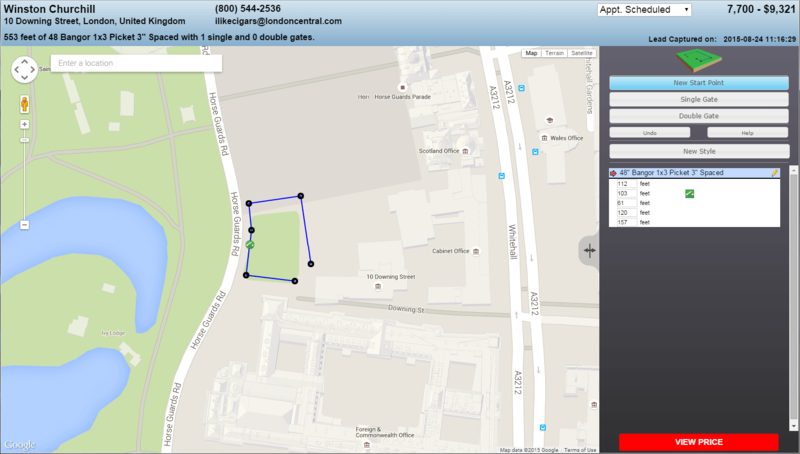 The app will use their address to locate and display their property on a Google map. The image can be toggled between map and satellite view. The prospect draws out their fence line and adds gates. They then choose a spec and the program calculates a budget. GeoDraw collects their phone number as they go to view the price. After seeing the budgetary estimate they can request your salesperson to contact them. Customers can recalculate their job with multiple styles or heights of fence. They can also include multiple styles or heights in the same session. The GeoDraw Dashboard has two levels, the Dashboard itself for managing leads, and an administrative level for creating Specs and app wide settings. The Dashboard displays three Levels of leads: Level 3 has requested you contact them, Level 2 has seen the budget price, but not requested to be contacted and Level 1 has entered the app, but not seen a budget price. There are buttons for viewing, deleting, or archiving each lead and a dropdown for lead status. The View button opens GeoView which is a total synopsis of the job the prospect entered including contact information, date, fence type, footage and gate, budget range, and project layout on a live GeoDraw screen. The Archive tab is home to the leads that have already been dealt with until you decide to delete them. Two other functions on this tab enable you to download all current leads to an Excel type (CSV) file or archived leads to a similar file. The Settings button on the Dashboard lets you direct notification emails to the people you want when a lead comes in, to add text and messages to the Reports page the prospect sees, set the range of pricing you want to offer, change the User password, assign a display order for specs, and instructions for embedding the app in your website. 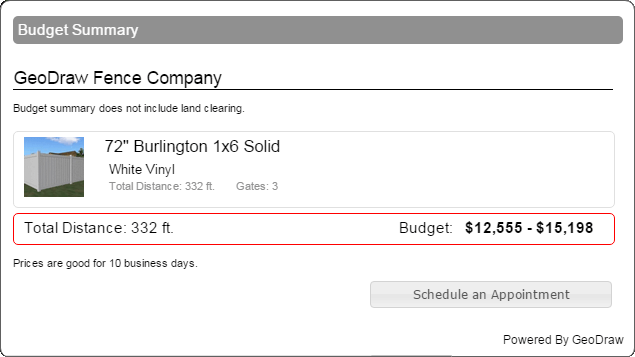 The Edit Specs button on the Dashboard lets you create the types of fence you want to offer (vinyl, wood, chainlink, etc...) and make or edit the fence specifications you want to offer in GeoDraw. Each spec can have one or more heights and a picture can be attached. Each spec has a price per foot, a price for single gates, a price for double gates on either a single level basis or a price for each height. GeoDraw requires no license, no contract, and no long term commitment. The cost of GeoDraw is only $99.00/month and you can cancel your subscription at any time. We offer these very easy terms because we know that the first qualified lead that you collect is likely to pay for the service for a long time. GeoDraw comes with one free hour of tech support, which will be more than enough to get you up and running. The setup is easy and the code to embed the App onto your website is provided and can be easily installed by your Web Master. Call us today to put GeoDraw to work for you. Please contact us via phone, email, or contact form.